This article was originally published in The Atlantic; to read the article on their website, click here. Depending on where you were this weekend, America’s crowds might have told you very different things about the state of the country. On Saturday and Sunday, thousands of people gathered at a dozen major international airports and in the streets to protest the president’s executive order on immigration and refugees. But on Friday, thousands more gathered on the National Mall for the March for Life, more in celebration than protest. Many felt encouraged, they said, about recent progress toward ending abortion, crediting Trump with taking steps on this issue during his very first week in office. Backstage at the March for Life on Friday, Metaxas told me he is feeling “tremendously encouraged” by Trump’s actions so far, particularly on abortion. By that point, drafts of the president’s executive action on immigrants and refugees were already circulating, and we discussed that as well: “When Trump says America first, it doesn’t mean cheering for America only,” Metaxas said. In general, he feels that the media has unfairly demonized the president, he said, and “we’re going to have to wait and see what he does.” Our conversation, edited for length and clarity, is below. Emma Green: How are you feeling? Eric Metaxas: I feel encouraged, tremendously encouraged. People on the pro-life side have never been merely advocating for an issue. [They have been] advocating for a fair debate. I think the science has so changed the debate that it will change the views of most Americans. I really think we’re at that point with sonogram imagery and a lot of the science that’s coming out, it’s getting harder and harder to deny that [a fetus] is a person. I’m encouraged that because of Vice President Pence and President Trump and Kellyanne Conway, the truth will out. Green: What have been your perceptions of President Trump so far? Metaxas: He’s been shockingly, and perhaps even ironically, the most pro-life president in the history of the republic. Green: Why do you say “ironically”? Metaxas: “Ironically” because he is widely perceived as being anything but a social conservative. Somebody who has had three wives and who has been pro-choice most of his life is not the person you’d expect to advocate for the unborn. But he’s 70 years old. I think he has a sense of the weight of his new position. He has genuinely done something many Never Trumpers scoffed that he would never do: Be faithful to his campaign statements on this issue. That alone is newsworthy. In one week, he has called out ABC News for not covering this March and encouraged people who have been laboring in the trenches. And also, the fact that he’s deputized the vice president and Kellyanne Conway to be speaking at the March today—it’s utterly astounding. Everyone here is profoundly encouraged. Green: A lot of people are worried about refugees and immigration right now. Does this connect to the pro-life movement—standing up for families and people who have been persecuted on the basis of religion? Metaxas: It’s all the details. You can err on either side of this. We’ve always been the most generous nation in the world when it comes to caring for those outside of our borders. The question is in the details: How do we keep the nation safe at the same time? When Trump says America first, it doesn’t mean cheering for America only. It means if you want to care for your neighbors, you have to make sure that you are yourself, first, healthy. Just like they say on the plane: Take your own mask first before you help the person next to you. You’re both going to drown or die if you don’t take care of yourself. Trump errs on the side of bluster sometimes for effect, but I don’t think that the people who voted for him, most of them, would ever be for not caring for immigrants or refugees. People in the church know it’s our obligation. The only question is how. Green: If you had to give a general sense of how you’re feeling about the president right now, what his presidency means for the church and for America, what would you say? Metaxas: Tremendously hopeful. I’ve never seen a president do what he said he was going to do so clearly and so rapidly in my life. The days of business as usual are over—that has been corroborated by the facts of the recent week. Any American would have to be happy and hopeful about that. Green: But there are a lot of Americans who aren’t happy and hopeful. Metaxas: If I sat down and talked to them, I would say … it’s an amazing thing to have an American politician, much less the president, actually saying what he means so that he actually act on it fairly quickly. It’s shocking, and genuinely hopeful for politics in America. I would give Sean Spicer a pass. I wasn’t happy about what he said. But I just thought, “Given the context, no wonder they’re crazy angry.” It was a bad start, but I kind of understood how it happened. Green: Evangelical Christians, as a group, are committed to the idea that there is a truth that can be firmly established. But at times, this does not seem to be Trump’s worldview. Take voter fraud—a claim he has repeated with no evidence to back it up. Metaxas: I’m dying to see what this investigation will turn up. Here’s one thing the media and all of us should learn: Trump is not wrong nearly as much as everybody says he’s wrong. In the end, often, what he’s said has been corroborated. I don’t think it’s a bad idea to look into it. It undermines democracy even if there’s a perception of voter fraud. Green: But isn’t there a perception of widespread voter fraud in large part because the president of the United States keeps saying it? Metaxas: There’s this perception on both sides. You’ve heard people on the Democratic side saying there’s voter suppression. We can’t have a functioning republic with either the perception of voter fraud or voter suppression. It’s healthy to look into it. If he ends up having egg on his face, tough luck for him. Green: But don’t you think it’s damaging for him to repeat this, or for Sean Spicer to repeat this, without having any evidence to support it? Metaxas: I’m willing to give him the benefit of the doubt thus far because I, and many Americans, have been unfortunately trained by the press in recent years not to take their side automatically anymore. They have tremendously undermined themselves. The New York Times, which I’ve read my whole life, has never in my life stooped to these levels of partisanship. They’re so out of touch that they think it’s journalism. They’re going to have to understand that Americans don’t take them or mainstream media as seriously as they once did. They’ve hurt themselves. And the media has to repair the damage. Green: You’re a student of the Holocaust. You know, more than most, how damaging it can be to levy accusations at the press and undermine that institution. In Nazi Germany, they were called the Lügenpresse—the lying press. Metaxas: But what if it is? Press advocacy for Hillary Clinton was nothing less than scandalous. As an American, I was sickened. They’re destroying themselves. They’re destroying a vital institution of the republic. Green: But a lot of people on the left blamed the media for over-covering the email scandals. They say the media brought Hillary Clinton down. Don’t you think the press gets criticism from both sides? Metaxas: I don’t think that is true. I would state boldly that the mainstream media heavily covered for Hillary and for Obama. To do that is nothing less than scandalous. It’s sickening to me. I take little joy in it. I went to Yale. I’m a writer. I know that world. I live in Manhattan. I know that most of the people in the media have genuine contempt for Trump voters. They elected the president of the United States. That’s not “some people.” That’s the American voter who elected the president of the United States. The people in the media, the people at The New York Times—they don’t know anybody who doesn’t think the way they do. Or they think that if you think [differently], you’re some sort of exotic beast and they’d love to get a look at you. That’s lazy journalism. They need to work overtime to get in touch with those people and stop demonizing them and stop sneering at them. Green: Do you support Trump’s executive order on immigration and refugees? Metaxas: As far as I can tell from my limited reading, the order is not what so many are saying it is. David French in the National Review had the most clarifying article on it, making it quite clear that President Obama essentially did the same thing, but at the time the media entirely gave him a pass, which sadly was often the case during his eight years. I think it’s largely because of the media’s witting and unwitting collusion in carrying President Obama’s water that we now have Trump as our president, although that’s another story, of course. Many people seem too angry to think clearly about this. So yes, I am very worried about the outrage over this executive order and the fury at Trump in general, because there seems to be more smoke and noise than what would be very helpful clarification. Trafficking in cliches about “love” over “hate” will not bring morality or sanity to our foreign or domestic policy. Who doesn’t prefer “love” over “hate”? The real question is what are the policies that we adopt, and how can they best reflect love and generosity, while still protecting our citizens. There is no substitute for that rational conversation. But the idea that borders are somehow “hateful” is so inane I find myself deeply concerned for my nation. If we cannot understand the fundamentals of what it means to be a sovereign nation, how can we ever see when nationalism actually veers into real jingoism? How can we see the difference between a healthy patriotism and a selfish tribalism? If saying “I love America” means “I hate other countries,” we have fallen into an Orwellian death spiral in which language is useless and power is the only language. That state is called “mere anarchy,” and in such conditions no one suffers more than the poor and the disenfranchised. Green: Do you think the temporary ban on refugees and limits on immigration from certain countries lines up with the vision of the church as you understand it? Metaxas: If one is looking coldly at the facts, one cannot help but realize that we are now holding Trump to a standard to which we did not hold President Obama. A temporary ban on immigration is a temporary ban on immigration. It is not the demonization of any group. It is a sober decision that is meant to help us make further sober decisions in future. If the ban is enacted ham-handedly, that’s another story, and I’m sure it has been in a few instances. But a soupcon of grace in all of this will go a very long way. Who doesn’t love to feel morally superior? But many of us are now using whatever Trump does as an excuse to exercise indignation. Not doing that would be smarter for all concerned. If the president is nothing but a bogeyman and piñata, we cast ourselves not in the roles of responsible citizens, but in the roles of everlasting flailers, which cannot end well. Green: And finally, do you think Christians should get priority over other groups in consideration for refugee status? 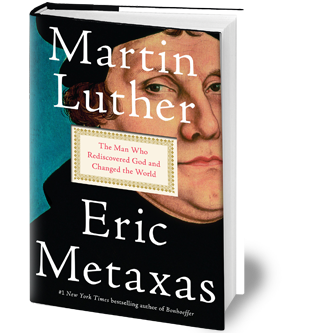 Metaxas: Generally speaking, absolutely not, because nothing could justify that, and no Christian could give a biblical reason for that. But what is happening now is another case. It is like affirmative action, in which past errors are being redressed. Obama’s policy toward persecuted Christians was bizarrely hostile to them, and our new president took note of that and is doing what he can to bring them to safety, as he said he would during the election. If that had been done in the last four years, Trump wouldn’t need to do it now. America elected him and he is the president. If our understanding of this nation and that office are so enfeebled as to make dealing with the current situation impossible, we will harm both dramatically and perhaps fatally. That should give us pause.